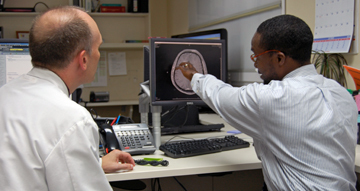 The Clinical Medical Physics Residency Program is 24 months in length to include 12 clinical rotations, didactic courses and conferences, written report assignments, and oral examinations. 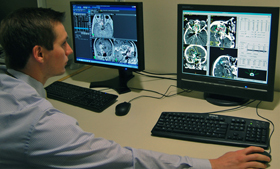 In addition to the experiences from didactic training and clinical rotations, the Medical Physics residents receive clinical training through their participation in monthly quality assurance on the linear accelerators, perform IMRT quality assurance measurements in film and ionization chambers, and perform electron cutout measurements. Medical Physicists entering the program can expect to be exposed to a broad variety of external and internal radiation delivery procedures. A collaborative atmosphere encourages research with faculty in the department and university community to engage in a broad range of projects often utilizing the skills of Bioengineers, imaging specialists, computer scientists and physicians. Our residents are not only prepared for board certification but trained to provide quality medical care upon graduation from the program. The Radiation Oncology Residency Program is a fully accredited, four-year graduate medical education training program at the University of Iowa with a complement of seven residents. The four-year curriculum provides residents with ample opportunities in the clinic to learn and use multiple state-of-the-art technologies. Residents learn how to use 3D-coformal radiation therapy, intensity modulated radiation therapy, sterotactic radiotherapy, radiosurgery and brachytherapy. Residents are also exposed to other technologies such as virtual simulation, on-line portal imaging, MR spectroscopy, PET imaging, megavoltage conebeam CT scans, and 4D CT scans. As the state medical center, training exposes the residents to a broad demographic of patients requiring a broad range of treatment types. Residents have the advantage of faculty who use general and specialized EBRT, LDR and HDR brachytherapy and IORT. Besides clinical experience, residents benefit from a strong didactic curriculum that includes several weekly conferences, tumor boards and graduate level courses such as Biostatistics, Radiation Biology, and Medical Physics taught by faculty experts. A research curriculum was recently added, giving each resident dedicated time to learn, work with faculty and pursue their research interests. Graduates have been successful in private practice and academic careers. Learn more on our Radiation Oncology GME page.